The UK has an ageing population, which means that the amount of pressure on hospitals and the care sector in general is increasing. Personal alarm systems can help. Having an alarm means that people can continue living in the comfort of their own home – rather than moving into a care home or staying in a hospital bed that is in demand. The aim of this article is to show what the personal alarm is all about. We will explain why this service is needed, before explaining the different parts that come together to create peace of mind for everybody involved. A personal alarm is an ideal solution for people who live alone. For those in this situation, there is always a worry about what will happen should they have some sort of accident in the home. Even if they live with others, it can be difficult to get the help needed in an emergency situation. Statistics show that in the UK, falls are the most common cause of injury related deaths in people over the age of 75. A national audit released in 2016 claimed that falls among older people was now the most common cause of major trauma seen in NHS hospitals. A pendant alarm gives older people a lifeline for situations such as this. If an incident takes place, such as a fall, he or she can press one button and help will be with them before they know it. Without a personal alarm there is a chance that they could be lying on the floor for hours, or even days, before somebody comes to visit. Even if it is never used, a personal alarm will give a psychological boost to the wearer. They will feel more confident and enjoy living in the comfort of their home, rather than being forced to go into a care home. Personal alarm systems tend to come in two parts. The first is the base unit, installed by connecting it to the mains power and telephone socket. The base unit is the system’s hub and will be used by the Care Team to monitor and speak with alarm users. The best example of a personal alarm base unit is the Lifeline Vi Alarm. The Lifeline Vi Alarm Base Unit contains the very latest Telecare technology. The ‘hub’ is manufactured by Tunstall in the UK and is their sixth generation personal alarm unit. The base unit is a good size and comes in a grey and white finish. The unit will easily fit in with other bits of furniture at home. The unit is very easy to install and can simply be connected up by the alarm user or by one of their friends or family. To begin, plug the personal alarm into the existing telephone socket. Next, plug the telephone into the unit with the adaptor provided. Finally, plug the alarm unit into a power socket and the device will be ready to test. To test the alarm, press the red help button on the base unit. The Care Team will know that the alarm is being tested and will respond over the loudspeaker. The team member will talk the alarm user through the test and let them know that everything is up and running. We advise that the alarm is tested at least once a month. As mentioned, the Lifeline Vi Alarm Unit features a loudspeaker and microphone. Our Care Team will use this to communicate with alarm users in an emergency situation and during the monthly test calls. The loudspeaker has been designed to be loud enough to be heard even if the alarm user is not in the same room. There’s no need to panic if the alarm user can’t hear the Care Team in an emergency, help will still be arranged and sent to their home. The personal alarm will also continue to work during a power cut. The Lifeline Vi Alarm has a back-up battery which has a 40-hour charge. This battery will kick-in should a power cut occur, to ensure that you can still call for help if you suffer a fall during this time. Once the power cut is over, the back-up battery will begin to charge once again so that it is fully charged and ready to boot-up should another power cut occur. Read more about the Lifeline Vi alarm unit. The second part of the alarm system comes in the form of a pendant button. This little button can be pressed by the user to indicate that they need help. The pendant should be worn throughout the day, whether the user is inside the home or outside in the garden. Every Lifeline Vi Alarm Unit comes with a MyAmie Pendant, which will be worn by the alarm user. This Pendant has been designed with the user’s comfort in mind. The Pendant is small and discreet, which ensures that it can be hidden easily and won’t attract attention. In fact, the pendant is half the size of the previous model – but the button is a third larger. Waterproof – The MyAmie can be worn in the bath or shower – where falls are more likely because of slippery surfaces. 100 Metre Range – The pendant will work outside in the garden. It has a range of up to 100 metres, which means that alarm users can still enjoy playing with their grandchildren outside or preserving their garden. No Charging – The MyAmie uses batteries, which last around seven years, and a replacement will be issued once they run out. The MyAmie Pendant is comfortable to wear, with some customers never taking their device off – even when they leave their home. An additional pendant can also be added to the system. One could be for inside the home and the other for the garden. Alternatively users could leave a spare on their bedside table. Read more about the MyAmie Pendant. The Vibby Fall Detector is sleek, stylish, technologically advanced and can be worn around your neck just like the MyAmie Pendant. The main difference is that the Vibby can detect when you suffer a fall, and will automatically send an alert call to our Care Team – there’s no need to press a button. The vibby pendant is sleek and stylish, finished in a modern, shiny white finish which is made from hypoallergenic plastic. It weighs only 35g and can be hidden from sight rather easily by tucking it under your sleeve. Waterproof functionality means that you’ll be able to raise an alarm if you slip in the bathroom. A red LED light will flash to signify that a call has been made to our 24-hour Care Team. Confirmation that an alarm has been raised is shown via an LED light on the Vibby, which will also vibrate to signify that an alert call has been sent. To cancel an alarm call, simply cover the face of the Vibby with your hands, or stand up with the 20 second period after the fall was detected. Read more about the Vibby Fall Detector. Red Help Button – This works in the same way as the red pendant button. This can be pressed in an emergency situation as an alternative. Green Cancel Button – Press this button if the red help button is pressed by mistake. The help call will be cancelled. Don’t worry if the alarm call isn’t cancelled in time, the situation can be explained once the Care Team has answered. Yellow Home/Away Button – This button can be pressed if the alarm user is going to be away for a long period of time. It let’s our Care Team know that there is no need to panic if they don’t hear from them in a while. Read more about the three buttons on the base unit. Once the alarm is installed, Lifeline24 customers are connected to the Care Team. They will be ready to take calls 24 hours a day, which means somebody will always respond when the pendant is pressed. The Care Team have been Accredited from the Telecare Services Association (TSA) for our life-saving service – industry and standards body for Telecare and Telehealth services in the UK. A team member will respond within seconds and speak with the alarm user over the base unit’s loudspeaker, to see what has happened. The situation is then assessed to see which steps need to be taken. The team member will call emergency contacts (see section below) and explain what has happened. The emergency services will also be notified if needed. We keep medical records on file, and this information will be passed onto the paramedics. This places them in the best possible position to help once they arrive on the scene. The team member will keep checking on the alarm user to reassure and check on them. Help will arrive at the front door. With a Keysafe installed, paramedics will be able to gain access to the property if the door is locked. Read more about the Care Team. Emergency contacts are a very important part of our service. These are the people who will be contacted should an alarm user press their pendant. They will be contacted by our Care Team, informed of the situation and asked to travel to the alarm user’s home immediately. For our system to work in the most effective way, we do require at least one emergency contact who ideally, lives within 45 minutes of the user. The Care Team will work their way through the list of emergency contacts in the hope that one will answer and will be able to assist the user. If they, for whatever reason, are unable to contact one of the nominated people, they will contact the emergency services, should they not be able to get through to anybody. Don’t worry, the emergency services will always be contacted should they be needed. Once the elderly alarm is installed users will be connected to our Care Team. The highly-trained team work 24/7, 365 days a year to ensure that our customers always have somebody to call for help. Read more about Emergency Contacts. Personal alarms are exempt from VAT. As long as customers meet the criteria set by Her Majesty’s Revenue and Customs (HMRC) there is no need to pay any VAT when the alarm is ordered. Read more about VAT exemption. There are a few misconceptions about the personal alarm that may make some people hesitant about joining our life-saving service. Our alarms are quick and easy to install and are very simple to use. There’s no need to have any concerns about joining our service and we can ensure that these myths are just that. One myth about personal alarms is that they won’t work during a power cut. This isn’t the case. Our alarms have a back-up battery, which includes 40 hours of charge. Should a power cut occur, this back-up battery will power-up to ensure that you can still press your pendant for help. Once power is restored, the back-up battery will begin to charge once again so that it is ready for the next power cut. See our top five myths, which will put minds at ease about the personal alarm. Read more about the myths surrounding our service. A personal alarm adds safety to the home. A Keysafe adds a little extra security. A Keysafe is a secure metal box that can be attached to the exterior wall of a property. Inside the keysafe, the owner keeps a spare key, or keys, to their home. This is much better than hiding spare keys underneath plant pots and door mats. Doing this can leave someone’s property in danger from thieves who check for keys in spots like these. With a Keysafe, keys will be locked behind a secure door and a code chosen by the owner. This code should only be shared with those who need access to these keys. The code should also be passed on to the Care Team, as they can then share this information with the emergency services during an emergency. Having this code will save time and allow paramedics to gain access to the property without causing any damage. This article has already touched upon how the personal alarm service can help ease the pressure on the NHS, but it is how it helps boost the morale and mental well-being of those who use it that is the real benefit. Having an alarm at home boosts the confidence of the user and gives their families peace of mind that help is available when they need it. Residents who live alone no longer have to think about what might happen should they have an accident. Day or night somebody will be there to respond and send help. As mentioned, it also helps to reassure families that their loved ones are being looked after. Should anything happen, the family will be the first to know about it and they can then visit their loved one’s home and help them. 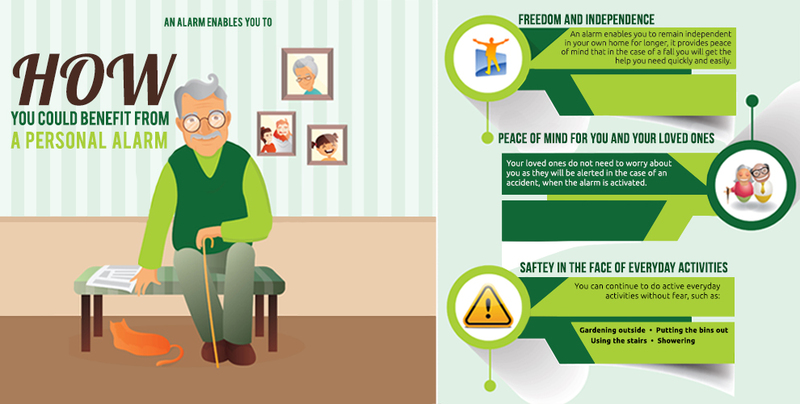 Lifeline24 provides peace of mind to everybody involved. Once you join our life-saving service you’ll also be assigned a dedicated account manager. This means that if you have any queries about your account you’ll be able to give your account manager a a direct call and talk about them over the phone. For more information on purchasing one of our life-saving personal alarms, send an email at info@lifeline24.co.uk or speak to one of our friendly advisers on 0800 999 0400. Alternatively, complete our contact us form and we will get back to you as soon as possible. Editors note: Originally published on October 2, 2017. Updated on January 25, 2019 to include up-to-date information. Does the alarm/box still work in the event of a power cut? The personal alarm will still work during a power cut. The alarm has a back-up battery which has a 40-hour charge and this will kick-in should a power cut occur. Once the power cut is over, the back-up battery will then begin to recharge so that it is fully charged once again. I hope this helps. If you have any further questions please give our team a call on 0800 999 0400. A member of the team will be more than happy to answer your queries. Alternatively you can email your questions to info@lifeline24.co.uk. Once you order your personal alarm you will be given access to both an online and paper version of this form. If you have not received your form please give our team a call on 0800 999 0400. Does your system work if the wearer falls but is unable to press the button? Alongside the standard MyAmie Pendant we also have the Vibby Fall Detector, which is available on an annual plan. The Vibby is worn around the wrist and will automatically send an alert to our Care Team if the wearer has a fall – which means that you don’t have to press the button. You can read more about the Vibby Fall Detector here: https://www.lifeline24.co.uk/buy-now/vibby-fall-detector/. Hi can someone have one of these if they’re 44 and have a severe mental health disorder and anxiety. Thank you for your comment regarding the Lifeline alarm system. We do have many customers who suffer from various mental health conditions using our service. However, in order to determine whether this system would be suited to the person in question, I would strongly recommend giving a member of our Customer Service team a call on freephone 0800 999 0400. From here, the team will be able to provide the best advice for you as they will be able to establish further information about the situation. If the pendant alarm breaks is there are a charge for replacement? Thank you for your comment regarding the Lifeline alarm system. There are no moving parts within the pendant and the internal battery has a life of around 7 years so there should not be an occasion where it breaks. If however, in the rare event that the pendant breaks or does not function as intended, there would be no charge for a replacement. Simply inform our Customer Service team and they will be able to get a replacement sent out to you. I hope this answers your question, however if you require any further information please do get in touch. You say that the speaker in the unit is loud enough to penetrate walls. Is the opposite true, will the receiver pick up the voice of a frail elderly person from an adjacent room? The receiver on the alarm unit is extremely sensitive and would pick up the voice of someone in an adjacent room, however if there was other background noise such as a loud television or radio – this may cause some difficulty when it comes to the operator hearing the alarm user. In this situation, the care team would assume that help was required and contact the alarm user’s emergency contacts to attend to them. So rest assured that even in the event that the alarm user cannot be heard clearly help will still be called for them. I hope that this answers your query, however if you do require any further information please do get in touch. You are most welcome! I’m pleased you found my response useful. If you do find yourself with any further questions about our services, you’re welcome to contact us directly on the blog, via email at info@lifeline24.co.uk or by telephone on freephone 0800 999 0400. I am interested in installing a personal alarm system for my mother. Also the key safe. Do you offer a service where the key safe is installed when we purchase? I’m interested in cost of the life line with the vibbie fall device also. Could you contact me with a quotation please. Also do you do a device that works outside the 100m zone? Thank you for your comment regarding the Lifeline system. We can offer a key safe installation service at point of order if you so wish, this option is presented to you when choosing which key safe you would like to purchase. We have a range of options and quotations that we can provide you with, I will arrange for a member of the Customer Service team to be in touch with you. If you do have any further questions please do get in touch. My parents are elderly and insisting on remaining in their own homes. My father has paranoia and is therefore reluctant to pass on keys to anyone! Are the contacts required to have a key and if not how will the emergency services enter the property in the case of a fall. Thank you for your comment regarding the Lifeline personal alarm system. I completely understand, many of our customers feel the same way about giving keys out to other people. Have you suggested the possibility of a keysafe to your father at all? Our Supra C500 is one of only two police approved keysafes in the UK and has the same level of protection as a domestic front door. It has been rigorously tested and has a heavy duty locking mechanism using a long-travel bolt making it extremely pry-resistant. It also has a clutch mechanism which prevents the handle from being forced open. You can read more about the Supra C500 here https://www.lifeline24.co.uk/buy-now/supra-c500/ if you wish to show this to your father. We do not insist that emergency contacts must be keyholders. However, if none of the emergency contacts have a key, we would require a keysafe to be in place at the property in order to provide access to the emergency services should they be required to attend. I hope that this answers your query, but should you wish to discuss this further with a member of the team please do get in touch on freephone 0800 999 0400.
my wife is prone to falls and I am unable to lift her on my own, is this covered on your service. We do not provide a service whereby representatives from our company can attend your property to assist you or your wife. Instead, we would ask for some emergency contacts, friends, neighbours, family members etc who would be able to attend in the event of an emergency alarm call, for example aiding you in getting your wife back to her feet. Alternatively, we can contact the emergency services on your behalf should they be required. I hope that this answers your query, however if you do have any further questions please do get in touch with our Customer Service team on 0800 999 0400. What is the telephone number that is called when the alarm pendant is pressed? As this is an emergency line, this is not a number that we will publicly disclose on a blog in order to reduce the chance of unnecessary calls being made to the number. However, if you give our Customer Service team a call on freephone 0800 999 0400 and notify them of your account details they will be able to advise you of the number. Can this system be used where the telephone service is provided by internet router, not a landline? Thank you for your message. Unfortunately, our personal alarms only work with analogue telephone lines. However, if you give our team a call on freephone 0800 999 0400, you’ll be able to discuss your options with one of our sales advisers. I have terminal cancer and it is possible I will lose my voice sometime in the future. If I am unable to speak once I have pressed the emergency button, what will happen? This is a common question and an important one to ask. In the event that your alarm is pressed but you are unable to communicate, our Care Team will follow normal procedure. The first step would be to call your nominated emergency contacts and explain that the alarm has been activated, but they are unable to establish any communication with yourself. The team would ask your contacts if they were available to attend and make sure you were alright. If your emergency contacts were unavailable, our Care Team would then go on to call an ambulance and ask them to attend. Our Care Team would have your information available on your customer file, so they would know your health conditions. You can also leave special instructions for the team, so they know exactly how to respond in certain situations that are specific to you. I hope this information helps but if you have any further questions, please do let us know. You can also contact our customer service team if you would like to discuss anything further.